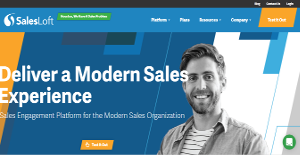 SalesLoft is an online platform built for efficient and revenue-boosting sales. It provides sales teams with enhanced capabilities for communication, while it integrates also email tracking and sales calls in a single platform. Thanks to its productivity, it can track all communication-related activities that have already been conducted. As a sales marketing tool, SalesLoft offers the promise of increasing qualified demos and appointments of up to 300%, and of helping save time through automation and approximate cadence creation. It provides an easy-to-use interface, and organized access to make sales work easier for its users. At the same time, SalesLoft is well known for providing a personalized outreach to customers that helps guarantee greater revenue for businesses in the long run. With SalesLoft, users can build a workflow that includes the ability to empower their Sales Development reps to create sales email templates and share them across the team. They can even track open and response rates, providing the ability to connect directly to the mail server so that every email is sent from the user and being alerted of every open, click, and response. The platform gives users the power to personalize a group of emails as much as necessary by being able to tap into fields in salesforce.com (including custom fields) to tailor each message with dynamic tags. As it was noted earlier, SalesLoft Integrates email and phone to track all communication activities in one platform, and use engagement to trigger the next activity. Users can automatically execute call lists, making those sales calls more efficient and simple with less time and effort. It even auto-populates prospect time zones so users can call at the right time to increase connections and provide better engagement. Simple voice drop and built-in call recording is also available and help make sales calls easier and more convenient. SalesLoft also helps accelerate sales development performance with real time actionable insights, analytics, and reporting. Data can be used to take actionable insights on when to send emails and make calls that are most successful based on reply rate and conversation rate. Companies have diverse needs and requirements and no software solution can be ideal in such a scenario. It is pointless to try to find a perfect off-the-shelf software product that fulfills all your business requirements. The intelligent thing to do would be to modify the system for your special requirements, staff member skill levels, finances, and other elements. For these reasons, do not rush and subscribe to well-publicized popular solutions. Though these may be widely used, they may not be the best fit for your unique wants. Do your research, investigate each short-listed platform in detail, read a few SalesLoft reviews, call the vendor for clarifications, and finally choose the app that offers what you require. How Much Does SalesLoft Cost? SalesLoft provides three SMB and enterprise pricing plans for users from all scales and industries. The plans are priced on quote basis, meaning that they correspond to the needs and requirements of each business. Take a look at the enterprise pricing details below, and contact the company to ask for your quote if your interested. We realize that when you make a decision to buy Lead Management Software it’s important not only to see how experts evaluate it in their reviews, but also to find out if the real people and companies that buy it are actually satisfied with the product. That’s why we’ve created our behavior-based Customer Satisfaction Algorithm™ that gathers customer reviews, comments and SalesLoft reviews across a wide range of social media sites. The data is then presented in an easy to digest form showing how many people had positive and negative experience with SalesLoft. With that information at hand you should be equipped to make an informed buying decision that you won’t regret. What are SalesLoft pricing details? What integrations are available for SalesLoft? Pros: SalesLoft has great set of features, but I personally like the live call listing, analytics and standardized reporting features. The support team is great, they respond quickly and they are dedicated in resolving the issues. They have done everything that we needed in order to achieve some of our goals. There is continuous training and they provide great practice sessions to teams. The voicemail dropper helps the team to increase the overall reach without personal touch to the prospects. Cons: There are some bugs with the SSO integration. Pros: Scheduling cadences improve productivity and being able to track emails allows for better overall success. Cons: It's like the people who built it never worked a pipeline or, frankly, tested out the UI. Common sense features, like automatically updating all "company" fields when the lead is updated or simple search for templates don\\\\\\\'t exist. Scheduling cadences improve productivity and being able to track emails allows for better overall success. If you need more information about SalesLoft or you simply have a question let us know what you need and we’ll forward your request directly to the vendor.